Fill your printer with paper and print out recipes, notes and other documents. Our own brand of high quality Clas Ohlson 75 g/m² printer paper is very affordable. 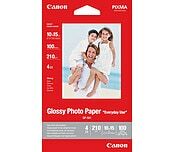 For photos and images, we recommend that you use specific photo paper for best results. Choose between several types of photo paper – we have various sizes and finishes such as matt and glossy photo paper. Select the correct type depending on what you need to print and which suits the printer model and type of photo you want. Design your own labels. Label your CDs/DVDs, books or photos simply and easily.